Here is the list of best free Interior Design Software for Windows. Using these free interior designing software, you can design interiors by adding partition walls, adding doors and windows, paint the walls with different colors, furniture, lighting, a number of floor and ceiling patterns, kitchenware, etc. Some of these are dedicated interior designing software and some are home designing software that offer interior designing options. Some of these software let you design interiors in both 2D and 3D modes, while in some 3D mode is only for viewing purpose. For designing interiors, you will find a lot of objects available in the library of some of these software, while others let you download objects from their website for free. The library of objects that these software provide may be standard models for representation or actual products from famous brands such as Roca, Ikea, Samsung, and more. Some of these software offer unique feature, which is what they call a 3 Dimensional walk mode. This feature lets you walk through your designed model in 3-Dimensional mode. All in all, these free 3D interior design software do not require any professional interior designing skills. Hence, anyone can use them easily for interior designing. Checkout the list of best free interior designing software to know their features. The software that I really liked while testing is Sweet Home 3D. Sweet Home 3D displays both 2D and 3D views simultaneously. You can give names to each object you add, change its dimensions and colors, and also make it invisible. The most interesting feature of the software is that it shows a list in which you can find all objects that you have used for interior designing. These unique features make it my first choice. You can also checkout the list of best free Home Design Software, CAD Viewer Software, and 3D Modeling Software. Sweet Home 3D is one of the best interior design software that lets you design interiors with a number of objects available in its library. Just drag and drop an object to place it inside a house. This free interior design software comes with different types of layout designs. Even if you want to design a layout of any irregular shape, that option is also available in the software. Anyone can design interiors of a house using this software easily. Start designing by choosing a layout from the available list or design a layout on your own, then construct walls or partition walls. After that, place the objects from the list to your design simply by drag and drop method. That’s how simple it is! 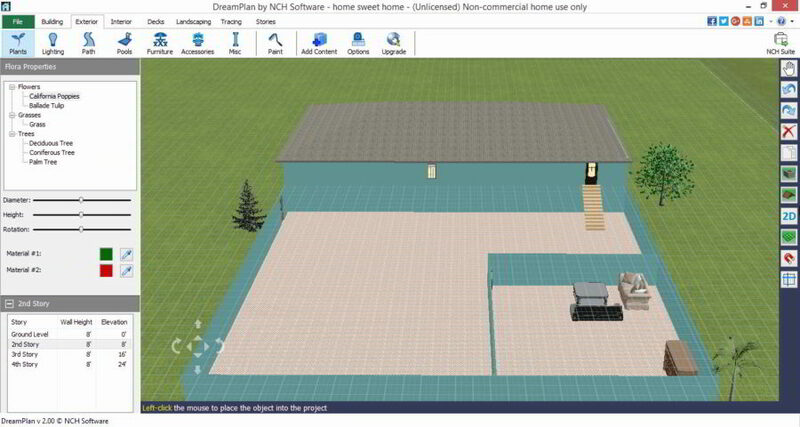 This software lets you add objects like beds, washbasin, aquarium, fireplace, lighting, plants, cooker, toilet unit, refrigerator, kitchen cabinets, and more. You can also download more models for interior designing from its official website for free. You can import objects in OBJ, LWS, 3DS, DAE, KMZ, and ZIP formats. It also displays the total area of the model in square feet. You can also change the dimensions of any object. It also lets you paint the walls with different colors. It displays both 2-Dimensional and 3-Dimensional views simultaneously along with the list of objects that you have added to interiors. With the help of scroll button, you can zoom in or zoom out of the design. You can also export your model to SVG and PDF formats. One of the interesting features of this free interior design software is that it comes with Virtual Visit option in 3D mode. This option lets you take a virtual tour of your designed model. You can also record a video of your visit in different formats. Sweet Home 3D is compatible with Windows, Mac OS X, Linux, and Solaris Operating Systems. 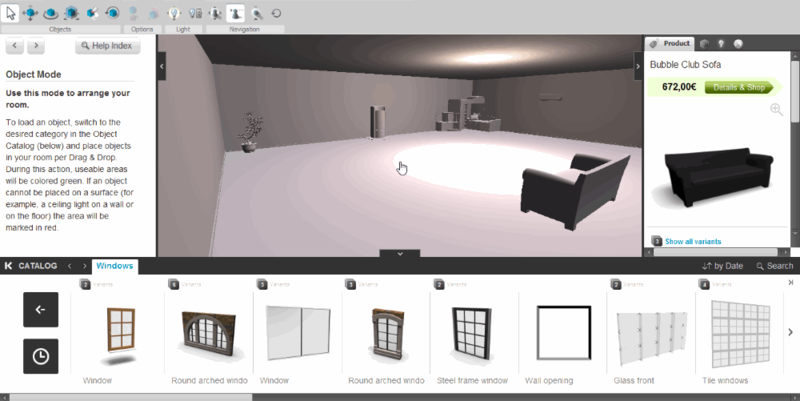 Amikasa is another free interior design software for Windows. The software displays designing and decorating tips for each object that make interior designing easy. You can choose any default layout for interior designing from the available list or design a new one on your own. 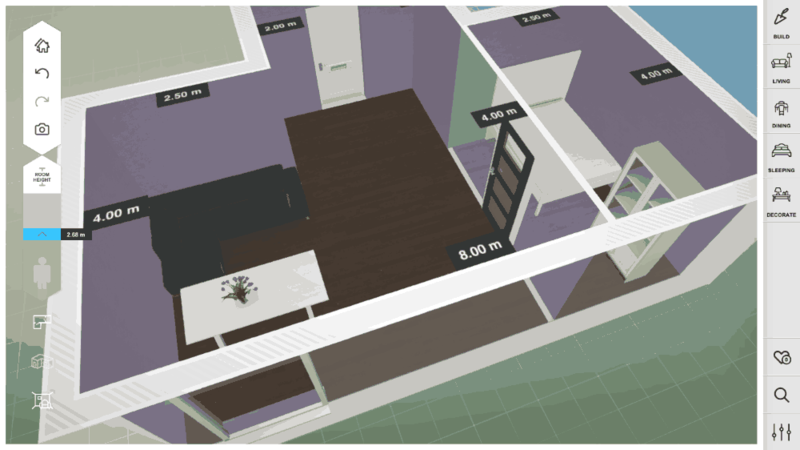 After that, select the size of your room and start designing by placing different objects inside the room. Use drag and drop method to place any object inside your design. This software features three types of views, namely 2D, 3D, and Inside view. The inside view allows you to walk through the entire design. Its library contains a lot of objects like armchairs, sofas, beds, plants, flowers, tables, lighting, curtains, TV, etc. You can use these objects to decorate interiors. All the objects in this interior designing software are real objects and come from famous brands, like: Thonet, B&B Italia, Living Divani, Acro, Montis, Vtwonen, Bolia, etc. A single click on an object opens the paint library which lets you change the color of that object. There is no need to resize any object as the software adjusts the size of every object according to the size of your room. You can add any object to My Favorite list. A complete product description is given for each object. You can take a virtual tour of your designed model. Just click on the camera icon to take a full screenshot. You can save and share it on social media. This software also creates a unique link of your designed model so that you can share it with anyone easily. 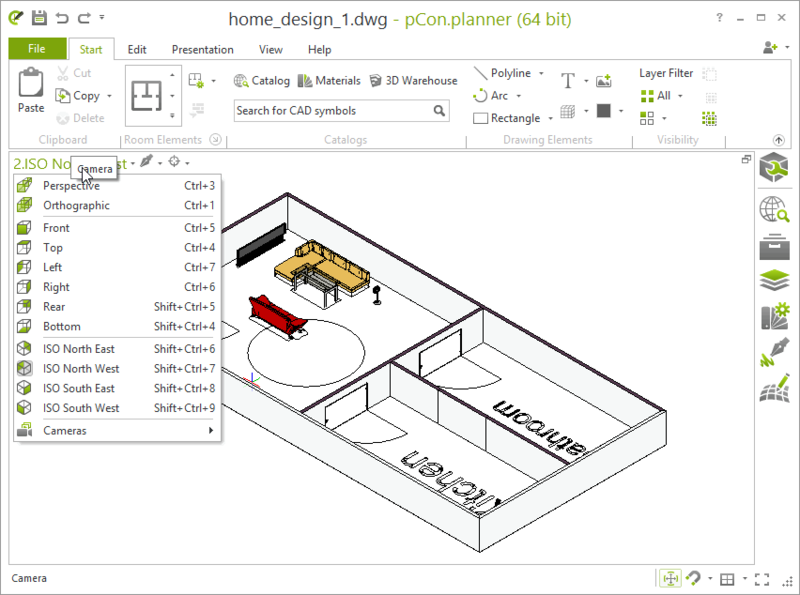 pCon.planner is another free interior designing software in this list. You will find all the necessary objects to design interior of a house in this software, like: beds, kitchenware, sofas, chairs, tables, fans, televisions. You can also give names to each part of the house for easy recognition. Designing instructions: Start by drawing simple shapes like a polygon by joining straight lines. In short, you have to design a base for your model. After that, construct walls on the layout you have designed, then start designing interiors by constructing partition walls and placing different objects in your design. This free interior designing software comes with a lot of features. A number of viewing options are available, like – 3 Dimensional view, 2 Dimensional view, front view, top view, etc. You can zoom in or out of any section and even move the whole design. Just drag and drop any object to place it inside the house. Resize option is also available in this free interior designing software. Besides this, you can create duplicate objects too. If you want to protect the selected objects from accidental editing, lock feature is available for that purpose in the software. You can hide or unhide any selected object or all objects except the selected one. Let’s have a look at some more features of the software. The split option lets you divide a wall into many sections. Directional zooming options are also available like – zoom North West, zoom North East, etc. Moreover, you can measure the distance between any two points and take print out of different views of your designed model. You can also share your designed model via Dropbox. This software comes with two interesting features. These are Look Around and Walk features. Look around feature provides you an overview of your whole design in all the directions and walk feature lets you walk through your design. Design interiors for free, using DreamPlan Software. The software is free for non-commercial use only. If you want to use it for commercial purpose, you have to purchase it from its official website. This interior design software comes with a huge library of objects which includes: cabinets, furniture, appliances, electronics, lighting, plumbing, and a lot more. You can use any of these objects for designing interiors. To use an object in your design, access the library to choose the object of your desire, then place it into your design by drag and drop method. You can also resize and rotate any object so that it can fit to the size of your design. Whenever you rotate any object, its angle of rotation is displayed on the screen. This makes you rotate any object precisely. Paint the walls on both sides of your model according to your own choice. You can also add multiple stories to your model and design interiors of each story separately. An autofill option is provided for your convenience which automatically places the roof with respect to the floor dimensions. DreamPlan interior design software can be installed on Windows 8, 8.1, XP, Vista, 7 and 10. Roomeon is another free Interior Designing software. It comes with a large library of objects like: doors, windows, plants, furniture, etc. Just drag and drop the objects from the list and place them in your design. You can rotate, tilt, or roll any object at different angles, and adjust the position of camera as per your convenience. It features three types of camera settings, namely: free camera, person camera, and satellite camera. You can also adjust the position of an object either by using a mouse or with the help of WASD keys. This interior designing software comes with a number of furnishing products from well-known brands: IKEA, Thonet, Claude Monet, etc. You can search for products from a particular brand by typing its name. Its catalog also contains electronics products from famous brands, like: SAMSUNG Electronics, LG Electronics, Apple, etc. You can use these products for decorating interiors. For each object, its price is displayed. Designing method: To design interior, select any of the objects of your choice from the catalog and place them in your design simply by drag and drop method. This free 3D interior designing software comes with an advanced feature which is a 3-Dimensional Walk feature. You can walk through the entire project you have created and experience it in real time. Use WASD keys to navigate the 3-dimensional view of your project. Roomeon works on both Windows as well as Mac. Note: Before installing this software on your computer, please ensure that your computer supports the 3D graphics and has the latest graphic card driver. Computers with the older graphic card drivers show grayscale view in the 3-dimensional mode. IKEA Home Planner Bedroom is a lightweight interior designing software. This software lets you design interiors of your bedroom only. You can design in both 2D and 3D modes and switch between them anytime while designing. A large number of objects are available in its library; select those objects which best suit your interiors. This free interior designing software contains furniture from famous brands like: Aneboda, Malm, Hopen, Tolga, Morrum, Hemnes, etc. Each of these brands has a number of products. Drag and drop any object from the list to place it in your bedroom. Besides this, the software also has a chest of drawers, queen and king sized bed frames, underbed storages, bedside tables, mirrors, etc. How to design interiors, using IKEA Home Planner Bedroom: Start designing interior by selecting any base layout from the list and start placing the objects from the available catalog by drag and drop method. 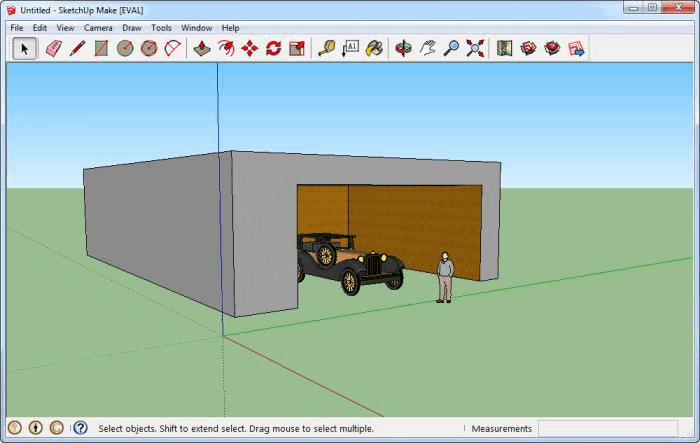 You can also add partition walls to your model. You cannot place doors and windows on any of the inner walls of the bedroom. You can neither design your own layout nor add more than one layouts to your design. You have to choose layout for interior designing only from the list available in the software. SketchUp Make is another free interior design software in this segment. 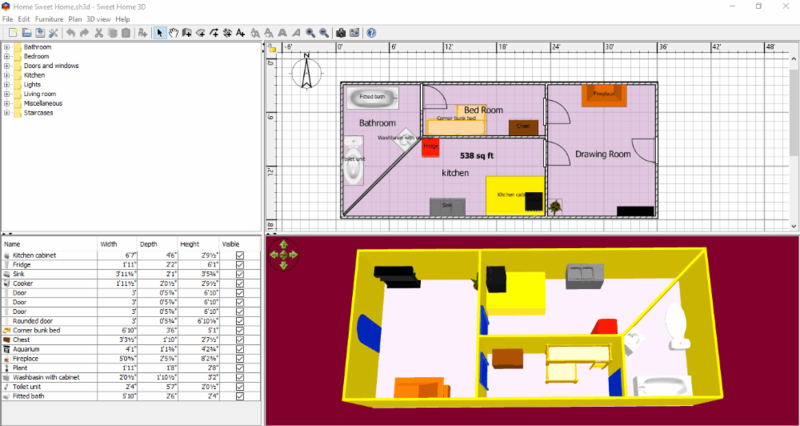 The instructor column on the right-hand side of the editor window teaches you how to use each tool to design interiors. You can add many objects to your design, like: beds, benches, couches, lighting, tables, etc. There are a limited amount of objects available in its library which you can use for interior designing. You can also add different textures to walls and floors of room. Drawing mode: Two types of drawing modes are available in the software, namely: Line mode and Freehand drawing. Line mode lets you draw straight lines to create a shape, whereas Freehand mode lets you to draw any shape freely. Moreover, fixed shape tools are also available in the software like: rectangle, circle, etc. Orbit Tool: Rotates the camera in all directions. Hence, this tool provides you an excellent view of your model from all directions. Offset Tool: This tool is very much helpful in creating borders at uniform distance. Push/Pull tool: This tool converts a flat base into a 3 Dimensional frame. Use this tool if you wants to draw a 3 Dimensional shape quickly. 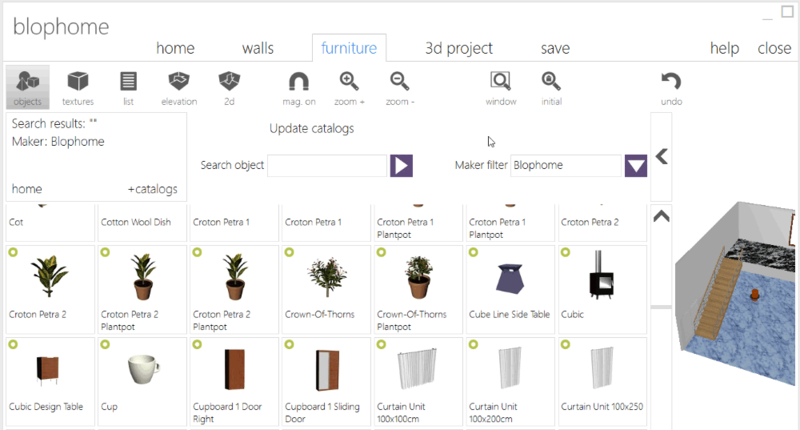 Blophome is one of the free interior design software that lets you design the interior of a home for free. The software comes with more than 10 layout templates. You can choose any of them for interior designing or you can create a design on your own. Some of these templates are – high ceiling template, 3 rooms template, corridor, U-Shaped room template, etc. You can add various textures to the walls and floors. A lot of objects are available in its library which you can use to decorate interiors. Some of these products come from well-known brands. Design and decorate the interiors of a home by following the same method as discussed above. This software contains the largest directory of objects as compared to any other software in this list. All these objects are arranged in an alphabetical order for your convenience. You can also apply filter to your searches. Some of the objects that it contains are musical instruments, tables, chairs, beds, decorative objects, electrical appliances, plants and flowers, kids furniture, etc. It also contains products from well-known brands like Roca, Samsung, IKEA, Kohler, etc. You can place your designed model at different sites of nature in realistic render mode. You can also see the list of all objects that you have placed in your design. On the completion of your project, you can save it to hard drive or share it via email. You can also publish a project to make it visible at Blophome’s website. 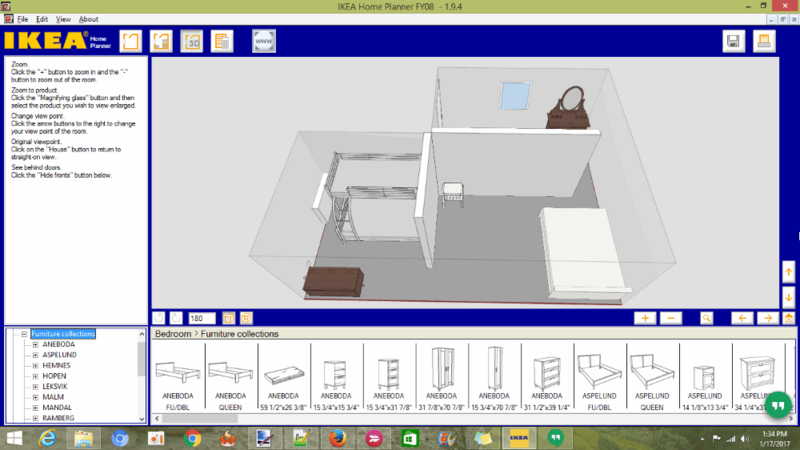 Planner 5D is a free Windows 10 app for interior designing. Its a feature rich interior design software with options to create floor plan and then add objects for interior designing. It has a good list of furniture, home decor, appliances, and other miscellaneous items. To begin designing with this free interior design app for Windows 10, you will have to first select a layout. You can also manually create a layout and start from scratch. After your layout is complete, you can begin by choosing color and materials for walls, floor, and ceiling. Then start adding objects to rooms for interior designing. Construction objects, such as: Windows, Arcs, Doors, Partitions, Stairs, Columns, etc. can be added. Later you can add objects to your deign. A huge list of objects are available to add. The list of objects include: Sofa, Bed, Storage, Table, Lightnings, Kitchenware, Bathroom-ware, Appliances, etc. Some objects for exterior designing are also available. Some of the objects in the list are locked, for which you will have to register for a Pro version. You can carry out interior designing in both 2D and 3D. After designing a floor, you can add multiple floors and begin designing for them as well. Once your design is finished, you can save your design as project on your computer. You can also share your project via email, Twitter, Facebook, etc. Option to take screenshot of a view in different resolutions is available. 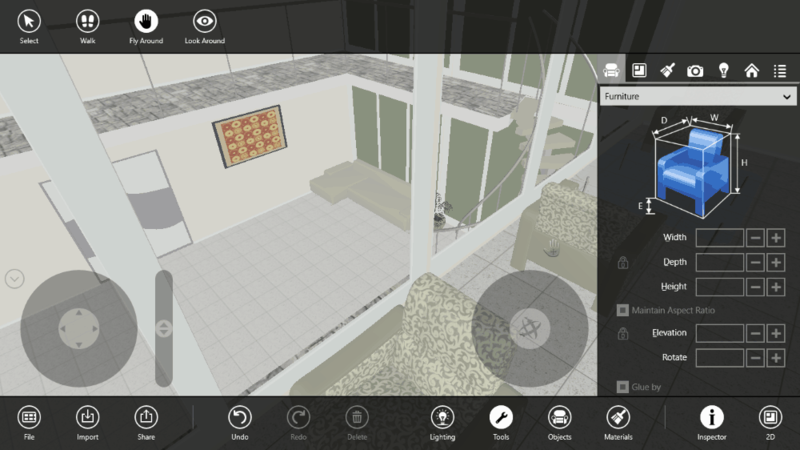 Live Interior 3D is an interior design app for Windows 10. You can create your own design or can choose from the given samples for interior designing. This app contains separate templates for designing interiors of different sections of a house, like: Bathroom, Living room, and Gallery. It also contains separate templates for designing interiors of office. You can paint the walls of your design simply by drag and drop method. You can move, resize, and rotate any object easily. A lot of objects are available in its library, like: beds, kitchenware, plants, pictures, lamps, fireplaces, lamps, etc. You can import any image to your design from your gallery. You can also import more objects from its official website. If you have installed clipboard to your computer, you can easily share your designed model otherwise you can share your model via email.